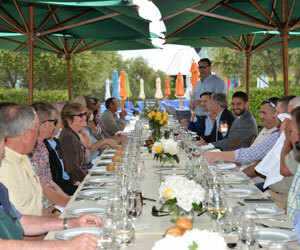 Steve Dutton greets more than 40 agriculture leaders for the premium member lunch at Francis Ford Coppola Winery. On April 20th, Sonoma County Farm Bureau’s Premium Members gathered at Francis Ford Coppola Winery for a luncheon. More than 40 top agricultural leaders in Sonoma County gathered near the pool with sweeping views of Geyserville and Alexander Valley on a sunny and 75° day. Guests enjoyed a 2014 Director’s Sonoma County Chardonnay and a 2014 Director’s Sonoma Coast Pinot Noir. For lunch, hand carved New York Steak was served alongside salmon, roasted potatoes, fresh salad and a chocolate mousse. 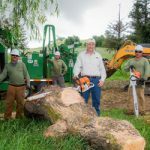 Steve Dutton, Vice President of Sonoma County Farm Bureau and chair of the membership committee, introduced special guest Efren Carrillo, Fifth District Supervisor, and hosts Ryan Stapleton and Krishna Hendrickson of Francis Ford Coppola Winery. Carrillo, chair of the Sonoma County Board of Supervisors, attended the event to mingle with guests and speak about pressing issues in Sonoma County. Carrillo addressed issues including the sustainable groundwater management act and affordable housing in Sonoma County. He also discussed rural roads in the county and said funds approved by the Board of Supervisor this year would begin to fix roads in 2017. Carrillo fielded questions from Premium Members about unions and SEIU as well as a discussion about the current ag overtime bill. Carrillo offered suggestions to members on each situation and Premium Members appreciated his honesty and transparency. Sonoma County Farm Bureau launched the Premium Membership category in the fall of 2014. Premium Membership was designed for large scale supporters with a strong belief in Farm Bureau’s mission. Members may join at $1,000 or $1 per acre over one thousand acres. 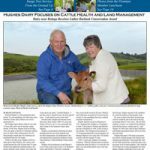 Sonoma County Farm Bureau currently has 26 Premium Members.